What has happened to the meat most of us eat is a travesty. When my grandfather's generation raised beef, the cattle lived a natural life in green pastures. There were no growth hormones or antibiotics. Cattle drank from natural ponds and grazed on open pastures unchanged since buffalo herds roamed. Today, most our meat derives from industrial-sized cattle and hog operations. These are typically crowded, horrendously unsanitary pens where animals stand in manure up to their ankles. Conditions are so unhealthy that they must be fed a steady dose of antibiotics; the same antibiotics that studies show are giving rise to antibiotic-resistant bacteria, a growing threat to humans today. If that wasn't bad enough, industrial meat operations give a steady diet of growth hormone to the animals, an unnatural mixture that makes its way into the human food supply with portentous consequences for our children. If consumers do one thing, then consider carefully what meat/poultry you eat. 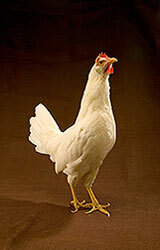 Though it may be more expensive, we recommend natural meat/poultry (no growth hormones, no antibiotics). Organic meat/poultry is another option, though the expense is greater. The pages and links here on naturalworldwideweb.com will hopefully help you find your way to more healthy meat/poultry options.